BART has recently completed the delivery of fisheries habitat improvements throughout a stretch of the Little Avon. BART’s operations team teamed up with volunteers from Charfield Angling Association to install habitat features throughout the fishing beat. Prior to the works, this section of river was over wide, straight and lacked cross-sectional habitat and flow diversity. 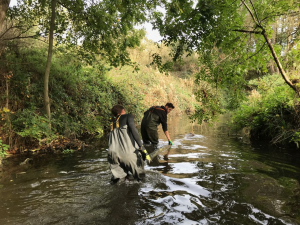 BART worked with volunteers to install a series of brushwood flow deflectors and mattresses to reinstate sinuosity and promote flow diversity throughout this section of the Little Avon. The working party assembled the structures in strategic locations, using brushwood from the bank-side, targeting over shaded sections of the beat to help thin out the canopy. 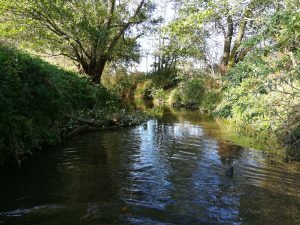 The structures will begin to influence river processes, forming habitat niches and refuge to support various life-cycles of fish and invertebrates. The work will begin to bed in over the next few months and whilst the added sinuosity is already evident, the river will continue to redistribute bed substrate, enhancing riffle-pool sequences throughout this stretch. Thank you to the Environment Agency for funding the project via the Fisheries Improvement Fund, and thank you to Charfield Angling Association and the respective land owners for their support throughout this project. It was a pleasure to work with all of those involved and we look forward to seeing the benefits over the coming years.